In stock 47 pcs. Also available in our walk-in store. Just like the PLCE water bottle pouch, but MOLLE compatible, with QR-buckle and MTP camouflaged. 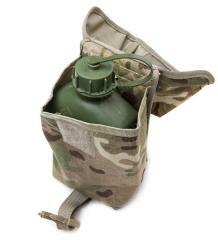 Genuine army kit for cheap! Made of Cordura, treated with waterproof coating on the inside. Being used, the coating might not be 100% perfect. Dimensions about 10 x 18 x 12 cm. Used, but completely serviceable. No bottle included. 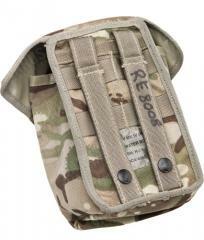 Some are UGL-8 pouches, these have a divider on the inside. It can be taken out of the way if necessary. Tähän mahtuu Ospreypullo , metallinen kuppi ja sen keitin sekä heavy cover -metallikansi. Muovikuppi ja muovikansi jäävät ulkopuolelle eli eivät enää mahdu mukaan. Vanhempaan taskuun, jossa myös kiinnikkeet kantohihnalle, mahtuvat nuo kaikki kilkkeet sisälle. Bought four of these. They look unissued, so I'm very happy. Perfect for a compact hiking set with the NATO water bottle, stainless cup and cooker. 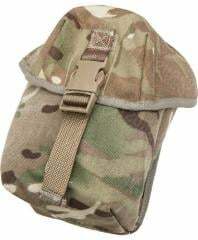 All fit perfectly in this canteen pouch. A classic army setup. There is even room for my foldable wood burning stove (not sold by Varusteleka), so I couldn't be happier. Another of my favourite bottles, the Nalgene Oasis also fits, although the bottle is a bit too high if you put it inside the stainless cup. You can still close the lid, but not as tight as I would like. Got mine new and quality of fabric is awesome ! Pikkuisen liian iso jotta SA-pullo olisi tukevasta kyydissä. Nepparit molle-lenksuissa ei ole erityisen hyvä, kun on tottunut Savotan /Särmä TEST:n systeemiin, siitä pois yksi tähti. Juomapullopussin sijaan tämä löysi itsensä pyörän kyydistä: mitä täydellisimmän kokoinen pussi Kryptoniten New York 1210-ketjulukolle, ei kilise pompuissa kun on tukevasti kasassa eikä kerää roskaa kopan pohjalta.